I walked into Lowes and was greeted by the grim reaper. Oh, it’s Halloween, I recalled. Yet, the backdrop was a bunch of Christmas trees with price tags attached. Yeah, if you say so. I look forward to celebrating Christmas… but not in October! 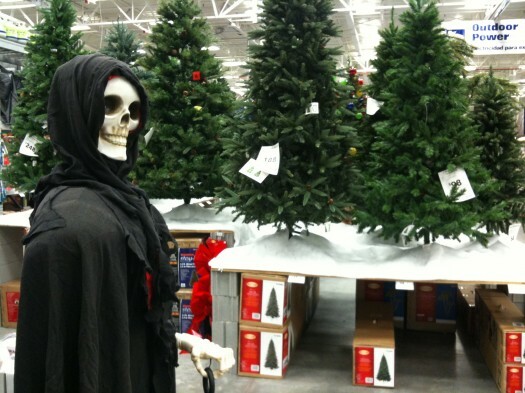 Let’s get Halloween and Thanksgiving out of the way first, Lowes, okay? Is the U.S. economy so bad that we have to fast forward 3 months ahead to Christmas? Kind of like the rush to nationalized healthcare. Haha. Great pic. Im in Atlanta too, near Stn Mtn, where is the afore-mentioned Lowes? Thanks, C.P. This is the Lowes on Roswell Rd in Sandy Springs. I think it’s more like: if you’re a retailer, you feel you can never do enough to sell your product, and everything in one’s life depends on sales. This has less to do with consumerism or the bad state of the economy, and more to do with the fact that we’re really fearful of a lot of things, I suspect. It is tacky, you’re exactly right. And you’d think in an era where all of us are familiar with investing, we’d know we can make money independent of sales. Lets take each occasion in its time. Lets give our our past ones a time also.